Blepharitis is when the rims of the eyelids become inflamed. This can make your eyes red, irritated and itchy. Dandruff like crusts can appear on your eyelashes. Blepharitis is a chronic condition, meaning that once it develops you will probably have repeated episodes. There is no cure however, there are a range of treatments that can control the symptoms. The most important one is to establish a daily eye cleaning routine. Complications of Blepharitis include dry eye syndrome (where the eyes do not produce enough tears or dry out too quickly), styes (a pus-filled swelling in or on the eyelid), meibomian cysts (a meibomian cyst is a swelling that occurs in the eyelids. They can happen when one of your meibomian tear glands gets inflamed) and conjunctivitis (inflammation of the eye). The condition is not normally serious. Serious complications such as sight loss are rare, especially when you follow the recommended advice. Most people will experience repeated episodes of Blepharitis and then have long periods of time when they do not have any symptoms. Your eyelids stick together and you may have problems opening your eyes when you wake up. A burning, gritty sensation in the eyes. Developing a regular routine of eye hygiene is essential in the treatment of Blepharitis. It is important that you clean your eyelids every day, whether or not you are experiencing any symptoms. You should consider it part of your daily routine, like showering or brushing your teeth. Effective eye hygiene will reduce both the severity and frequency of symptoms. You should apply a warm compress (cloths or cotton wool warmed with hot water) to your closed eyelids. Gently rub the compress over your closed eyelids for two to three minutes. This will help loosen any crusting. 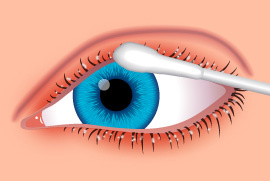 Then gently clean your eyelids with a cotton bud. Using warm water with a small amount of baby shampoo, or sodium bicarbonate (a teaspoon dissolved in a cup of water), clean the margin of lids and the base of the lashes. Clean both upper and lower lids. You should always use a mirror when cleaning your eyelids as this will prevent any possible damage to your eyes. A number of commercial products are also available for eye cleaning. Your Pharmacist will be able to advise you. At the beginning of treatment or if your symptoms are particularly severe, you may need to carry out this routine several times a day. Once symptoms are under control, it should only be necessary to clean your eyes once a day. You should avoid wearing eye make up especially eyeliner. If you feel that you absolutely have to use eye make up and eyeliner, make sure that it washes off easily. If your Blepharitis does not respond to regular cleaning, a short course of antibiotic ointments or drops may be recommended. In some circumstances, you may be given antibiotic tablets (oral antibiotics) at the beginning of your treatment. For example, when it is clear that a skin condition, such as rosacea is aggravating your Blepharitis. Oral antibiotics may also be recommended if you do not respond to other forms of treatment. Most people respond well after 2-4 weeks, although you will probably be required to take them for at least six weeks. It is important to finish the course even if your symptoms get better. Blephex improves the overall health of the eyelid and reduces many of the common symptoms associated with Blepharitis, including removing bacterial sruff and crusted debris. Maintaining a daily eye hygiene routine is the best way of preventing episodes of Blepharitis.